By now, everyone who pays attention to plants in our area has been overwhelmed with early-spring-itis in their gardens. The little daffodils and hellebores bloomed way ahead of schedule. 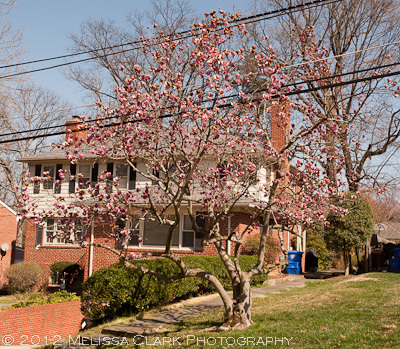 The Okame cherry trees started showing their flowers in February, for pity’s sake, and the Yoshino cherries around the Tidal Basin and elsewhere are at their peak right now. 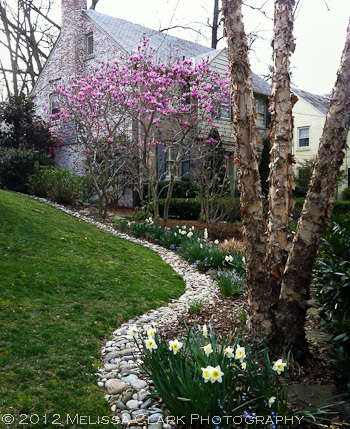 Forsythia, tulips and even some allium foliage are working it. Climate change seems here to stay. Some of the showiest spring-flowering trees around here are the deciduous magnolias: Magnolia x soulangiana (Saucer magnolia), M. stellata (Star magnolia), and a group called the ‘Little Girl Hybrids.’ Let’s start with M. soulangiana, which in fact was the first tree I learned to identify in my “woody plants” class in design school. 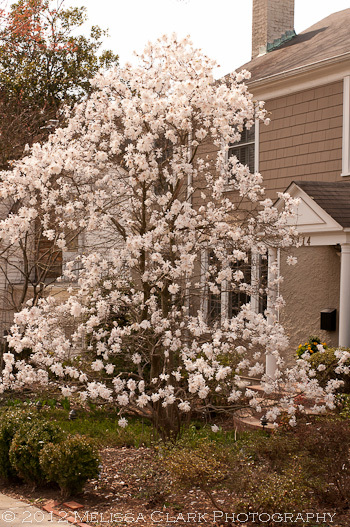 Saucer magnolias have an open, multi-trunk habit. In bloom, they are breathtaking. Saucer magnolias usually bloom here in early April. Their flowers look like tulips, at least to me; they do best planted in full sun and good drainage. My woody plants teacher recommended that we always plant them in other than south-facing sites because of the risk of warm late winter weather causing them to bud early, only to get caught by a late freeze, resulting in brown mush all over the branches where beautiful flowers should have appeared. 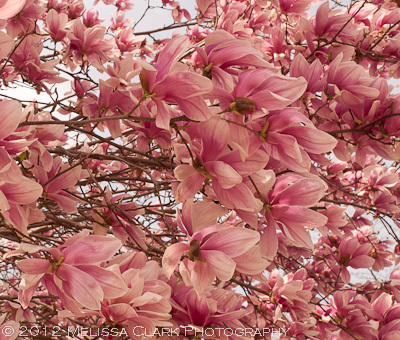 A mass of blooms on a pink Magnolia soulangiana. Next there are the star magnolias, which tend to be a little smaller than the saucer magnolias once fully grown. They have strap-like blooms and most varieties have white flowers. I grow ‘Royal Star’ in my garden, a white cultivar. This specimen, which I photographed last week in Northwest Washington DC, looks very much like mine. 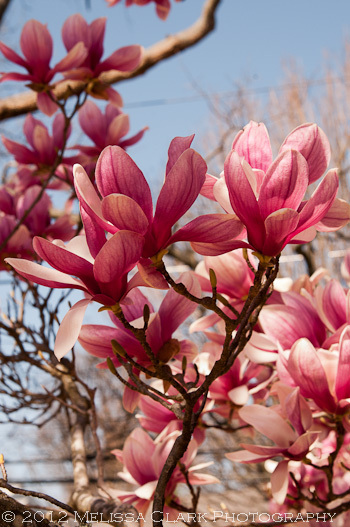 Star magnolias stay somewhat more compact and won't grow as large as the saucer magnolias. Then there are the’Little Girl Hybrids,’ bred at the National Arboretum to bloom even later than M. stellata, and bearing names like ‘Betty,’ ‘Ann,’ ‘Susan,’ ‘Jane’ and ‘Judy.’ Here’s a pair of ‘Betty’ magnolias that I planted in a client’s garden about ten years ago. I think the size is ideal for a smaller site. These 'Little Girl Hydbrid' magnolias are the variety 'Betty.' (Taken with my iPhone 4). On the whole, these trees have beautiful gray bark and root systems that don’t like being messed with. If you plant them, give them time to grow but realize that you won’t be able to grow much under them but groundcovers. Still, it’s probably worth the sacrifice. No gardens here. No glamour shots of the Eiffel Tower or other readily recognizable “must see” sights, other than some architectural shots I couldn’t resist. Just a few of my favorite images from my August trip to Paris to warm up your winter week. Hope you enjoy them.